VELCRO® Brand webbing allows you to create custom sized straps, when used in conjunction with VELCRO® Brand buckles and tri slides. It is UV stabilised and designed for outdoor use, and strong, with the capacity to hold up to 400kg. 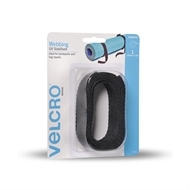 It is ideal for tie downs, straps and backpack and bag repairs, as well as many other uses.